The word ‘Probate’ itself is confusing… it literally means to prove. Probate means the legal process of proving a will after a person had died. We have set out below some general information about the process in order that you can understand when and why probate is needed, what needs to be done and how you can do it. We have also prepared a Legal Personal Representative Checklist along with Probate FAQ: we hope these will be of assistance to you. When a person dies and leaves a will dealing with their assets, the process to prove the Will and allow the wishes in the will to be carried out is called Probate. The person who looks after this is the person appointed in the will by the deceased and is called the Executor. The Executor is in charge to make sure the wishes contained in the will are carried out and their job is to obtain a Grant of Probate, gather the assets of the deceased, pay any debts, funeral expenses and distribute the balance to the people named in the Will due to inherit, known as the beneficiaries. A person applies for a grant of probate from the Probate Office in cases where a person dies and has left a will. The person named as the executor in the deceased’s will has the responsibility to apply for the grant of probate and carry out the terms of the will as laid out by the deceased. According to Irish Probate Law, the executor must administer the will but can renounce their obligation to administer the will if they wish. In this case, other executors in the will may move forward with the process. In cases where both executors will administer the will, both executors can apply for the grant together. A grant of administration is issued by the Irish Probate Office in cases where someone dies without having made a will. In this case, the person who will handle the deceased’s estate is called an ‘Administrator’. The Administrator appointed is generally the deceased’s next of kin. The person who is entitled to extract the grant of administration is decided on the date of death of the deceased. It is important to note is that the next of kin, under Irish Probate Law, is the nearest blood relative of the deceased at the date of death. The Rules of Intestacy will decide what next of kin will inherit and what shares they will receive. The Executor is a minor, or a person of unsound mind, or is disabled and does not have the capacity to administer the will. In these cases, the person who is entitled to the residue of the Will (assets leftover once all beneficiaries have been given their inheritance) is the person who is can apply for the grant and administer the will. If this person dies before the deceased, or if there is no residue clause in the will then Irish Probate Law will determine who will inherit the leftover assets and this will be the next of kin entitled to administer the will. If there is no will, the Rules of Intestacy will determine who is entitled to inherit and these generally provide that next of kin will inherit. The person entitled to inherit from the deceased (beneficiary) will be entitled to apply for a grant from the Probate Office known as a grant of administration. When do you need a Grant of Probate/Grant of Administration? A grant of probate/grant of administration is required once there is a substantial asset owned by the deceased, such as a bank account over €25,000, a house or land or a shareholding. Why do you need a Grant of Probate/Grant of Administration? A Grant of Probate/Grant of Administration is required because the assets left behind by the deceased cannot be legally dealt with without this document. The grant gives the Executor/Administrator the legal authority to access the bank accounts, transfer or sell the house, land or shareholding etc. The law requires a person to be responsible for the affairs of the deceased and for someone to be responsible for the obligations of the deceased’s estate such as taxes, debts and inheritance due to beneficiaries. The law also needs to provide a system to safeguard the deceased and ensure that the will is proved to be the last one and that all legal requirements have been followed. When do you not need a Grant of Probate/Grant of Administration? Generally, a grant of probate/grant of administration is not required if there are no assets, or all assets are held jointly as joint tenants, or all assets are nominated, or there are only small assets so the estate can be managed under the Small Estates Procedure. How do you know which Grant you need to apply for? 1. Is there a will? If yes, you must check the will to see if you are the named executor of the will. If you are the named executor of the will then you will need to apply for a grant of probate. If there is no will then the Rules of Intestacy should be reviewed to see who is entitled to apply for a grant of administration. In addition, Capital Acquisitions Tax (inheritance tax) returns must also be made on behalf of each beneficiary who inherits a certain value in inheritance. It is vital that these tax returns are filed and any tax paid on time to avoid penalties and interest. Worth noting is that the Executor/Administrator may be liable for such tax if the beneficiary defaults and thus the Executor/Administrator must ensure that the tax situation is reviewed fully. Beneficiaries are usually written to at the early stages of the administration of an estate and given information regarding their inheritance. If there is a will they will usually receive an extract from the will relating to them and will be asked to supply their PPS number and details of previous gifts or inheritances. If there is no will the beneficiaries will usually be advised that they are entitled to inherit under the Rules of Intestacy and they will be asked for their PPS number and details of previous gifts or inheritances. Once the grant of probate/grant of administration has issued and the estate assets have been collected and the debts and expenses paid, the beneficiaries are contacted regarding the inheritance due to them and the estate is distributed. Due to the delays in the probate process, there can often be quite some time between these two points of contact. Any non-cash assets, such as land, property or shares being retained can be transferred into the name of the beneficiaries due to inherit. Any cash in the deceased estates can be balanced in the estate accounts and the leftover balance of cash can then be distributed to the beneficiaries. Each beneficiary will be contacted regarding distribution and provided with the necessary papers to sign to transfer assets or receipts for receipt of monies. The issue of any inheritance tax (Capital Acquisitions Tax) payable is generally a matter for the beneficiary to look after. The executor/administrator would not be tasked with beneficiaries individual tax returns. If a charity is to inherit they will be contacted as a beneficiary at the early stages of the administration of the estate and an extract of the will detailing the inheritance left to them given to them. There is no Capital Acquisitions Tax (inheritance tax) payable by charities on inheriting and therefore no information is required from them. Additional paperwork detailing the inheritance left to the charity must be lodged with the Probate Office when applying for the grant as the Charities Regulatory Authority must be notified that the charity will receive this inheritance. Once the grant of probate/grant of administration has issued, the estate assets have been collected and the debts and expenses paid, the charity will again be contacted regarding the inheritance due to them and the estate is distributed. The estate accounts detail the full details of the estate including all values as at date of death, all payments and receipts, any losses or gains on estate assets from date of death to date of distribution and finally the final distribution account showing the distribution of the estate in accordance with the will or the rules of intestacy. The executor/administrator will approve the estate accounts after the grant of probate/grant of administration has issued and all assets are collected and debts and expenses are paid. Once estate accounts are approved, payments can be made to beneficiaries in accordance with the estate accounts. The entitlement to receive a copy of the estate accounts varies depending on the inheritance the beneficiary is due to receive. Generally, a beneficiary of the residue of an estate (leftover assets once all named beneficiaries are given their inheritance) or a person entitled to a share of the estate under the rules of intestacy are entitled to receive a copy of the estate accounts. How do you find out what assets and liabilities the deceased left? Practically, the starting point is to inspect the papers of the deceased. This will usually reveal financial institutions and standard reoccurring bills. Title deeds of property may also be located. If the deceased made a will with a solicitor there will likely be a note of assets and liabilities kept with the will which may assist. Each financial institution, insurance company, utility company etc. can then be written to request details of assets and liabilities. In the event of property, houses, shares or other non-cash assets, a valuation should be obtained from a suitable expert dealing the value of same. As tenants-in-common – meaning each person owns a specific and separate share e.g. one half each. Each co-owner can make a Will and leave their share to their chosen beneficiaries. As joint tenants – meaning all co-owners own the whole asset together and on the death of a co-owner, the remaining co-owners will automatically inherit under the legal rule known as survivorship. Assets held as joint tenants will be inherited by the surviving joint tenant co-owners automatically and are not dependent on a will or the rules of intestacy to pass on. Common assets held as joint tenants include houses, particularly the family home of a husband and wife. No grant of probate/grant of administration will be required to deal with these joint assets. Nominated assets are assets which are capable of being of being left to someone without the need for a will or the rules of intestacy. These are usually left by completing nomination paperwork with the relevant financial institution with whom the assets are held. Common assets held under nominations include life assurance policies and credit union accounts (credit union accounts can only be nominated up to a value of €23,000 only). These assets will pass to the people named in the nomination without the need for a grant of probate/grant of administration. It is important to note that the nomination cannot be changed in a will. Estate assets can be insured, practically the executor/administrator should always ensure that assets, such as houses and cars, are kept insured. Estate property such as land or houses can be placed for sale and an agreement made for sale and a contract signed. The contract will be complete once the grant issues. Nominated and joint assets can be dealt with. There are two application routes to the Probate Office, one for applications if you have appointed a solicitor to act and one for you to apply personally for a grant of probate/grant of administration. When you appoint a probate solicitor to apply for a grant of probate/grant of administration we will advise you of the necessary requirements and look after all matters concerning the estate including writing to banks, insurance companies and beneficiaries. We will also gather in the estate assets and handle the distribution to the beneficiaries. The information we will require is contained in our Executor/Administrator Checklist. Once full information is received we will draft the necessary application documents and arrange an appointment for you to sign same. Once signed we will lodge the papers in the Probate Office and advise you of the current backlog for the grant to issue. At the moment there is currently a backlog of approximately 16-20 weeks from the date of lodgement of the papers with the Probate Office. If the Probate Office raises a query regarding the application the papers will be rejected and further delays can be experienced. For this reason, it is essential that you are advised of all the necessary requirements and that the papers are correct when lodged with the Probate Office. Once the Grant of Probate/Grant of Administration is received from the Probate Office we will write to all financial institutions and take up funds, facilitate the sale of any properties/shareholdings and take up all other estate assets. We will complete Estate Accounts detailing all assets, payments and the distribution of the estate and these will be approved by the Executor/Administrator before any payments or distributions are made. Once the Estate Accounts are approved the debts and expenses of the estate will be paid and the net balance of the estate distributed to the beneficiaries in accordance with the Will or Rules of Intestacy. This may involve transferring properties to beneficiaries. Note: In certain cases, the following additional documents may be required, such as, if dementia is mentioned on the death certificate, an Affidavit of Testamentary Capacity will be required to be lodged verifying that the deceased had the capacity as at the date the will was made. This Affidavit is normally provided by the deceased’s general practitioner. Note: Depending on the circumstances of the individual case, additional documents may be required. The Probate Office will examine the application for the grant immediately (except for non-UK foreign applications) and raise any queries they have regarding the application with your solicitor. If a query is raised the application is rejected. Your solicitor will have to deal with the query and re-lodge the papers with the Probate Office. A resubmission fee of €40 is charged by the Probate Office for each time the application is re-lodged. The application will lose its position in the queue if it is rejected and will only enter the backlog once it is accepted by the Probate Office. Therefore, further delays can be experienced if queries are raised and it is vital that the application is prepared comprehensively to begin with. Once the Grant issues, all assets can be liquidated if necessary, gathered in, debts and expenses of the estate can be paid and the balance of the estate can be distributed to the beneficiaries. Monies due from bank accounts or assurance policies will be paid upon production of the grant of probate/grant of administration and the signing of the particular papers for the financial institution. The sale of land and property can be completed and the sale proceeds paid. Shares can be sold and the sale proceeds paid. In certain cases, it is possible for a personal application to be made to the Probate Office for a grant by the executor/administrator. This procedure involves assuming a lot of responsibility and the Probate Office will assist as much as they can but advise that they cannot provide legal or taxation advice. Any other circumstances, which, in the opinion of the Probate Officer, require the assistance of a Solicitor. The decision of the Probate Officer in this regard is final. * Domicile is the legal word used to describe the place in which the deceased person had their permanent home. Why are there restrictions on making a Personal Application? The restrictions are in place to ensure that legally complex matters proceed only with the benefit of legal advice and that in non-resident cases there is a solicitor acting within the jurisdiction that can assume a secondary liability for any taxes of the estate. Therefore, public policy and taxation compliance require these restrictions be in place. In general, we find that most of our Grants are obtained (approximately) within a six-month period from receipt of all relevant information. The timeframe is heavily influenced by the backlog in the Probate Office and is inclusive of such backlog. Once the Grant of Probate/Administration is issued by the Probate Office, it is sent to the various financial institutions and the assets of the estate are collected. These assets are then distributed. In the event of any queries arising in relation to the will or the will being contested, the process can take longer. In all cases, we will advise of the likely timeframe in light of the facts of each individual case. If the Probate office requires clarification of any issue in a will, it may be necessary to trace witnesses and have them assist in answering these queries. Fortunately, cases such as these are the exception rather than the rule and most grants are concluded within a six-month period from your solicitor receiving all relevant information. An executor/administrator has 12 months from the date of death to deal with the estate uninterrupted. After that time frame, the beneficiaries will be entitled to query delays and may apply to carry out the administration themselves if they feel that the existing executor/administrator is not performing their duties. It is important to note that it is very difficult to remove an executor/administrator and therefore advice should be sought should any concerns arise. Capital Acquisitions Tax (CAT) – This is inheritance tax that applies to beneficiaries of the estate. Generally, each beneficiary has a tax free allowance (a ‘threshold’) and will be liable for tax on any gifts or inheritances received in excess of this amount. Probate Tax – This tax only applies to estates where the person died between 18/06/1993 and 05/12/2000. Therefore, it is only relevant in very limited circumstances. The tax is payable at a rate of 2% and certain thresholds will apply to this tax similar to CAT. Income Tax – If the deceased made an income during their lifetime, income tax returns will have to be prepared to the date of death and any taxes paid. Similarly, in the event that the estate generated an income after the death of date and prior to the date of the distribution of the estate, the estate will have to make income tax returns and pay any income tax due. It should be noted that in the event that the only estate assets are bank accounts, Deposit Interest Retention Tax will be deducted from any income from interest on the account and an income tax return will not be required. Capital Gains Tax – In the event that there is a non-cash asset in the estate which is sold during the administration and the asset has increased in value from the date of death to date of sale, then a CGT return may be required and any tax payable must be paid. It is important to note that a suitable tax advisor should be appointed to deal with all and any tax returns for the estate. The issue of costs can be a worrying one for Executors, Administrators and Beneficiaries. The executor/administrator has the duty to agree the costs with the solicitor. It is best practice that certain beneficiaries are notified of the costs payable, generally the beneficiaries of the residue or beneficiaries under the Rules of Intestacy. Offer fixed probate fees with no hidden costs: this is particularly important so that there is full transparency for executors/administrators and Beneficiaries regarding the applicable costs. A fixed cost allows everyone to budget and plan and provides peace of mind. Whilst ensuring you receive the best advice: Our Probate Team boast three members of the Society for Trust and Estate Planners and our Lead Probate Solicitor is also a member of Solicitors for the Elderly. Let our expertise guide you through the process and make it easy for you. Your initial discussion will be with our dedicated Probate Team. From there should you wish to proceed you will then be issued with a detailed quotation outlining the estimated costs involved. Our standard fixed Probate Fee is €2,000+ VAT (at 23%) and outlays (such as Probate Office fees which start at €100 and vary depending on the value of the estate). With over 30 years of experience in Probate matters, Tracey Solicitors are well placed to help you deal with the administration of an estate during this difficult time. By speaking with a member of our probate team, you can help put your mind at ease if you are worried about any aspect of probate or if you need help with a will or inheritance matter. 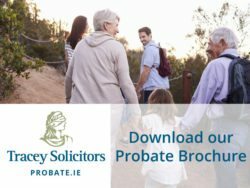 To discuss your best solutions and options call Maria Lakes, Head Probate Solicitor, on 01 49 9900 or via email to probate@traceysolicitors.ie to tell her about your situation.